The Brexit vote decimated legacy airline stocks late last month. 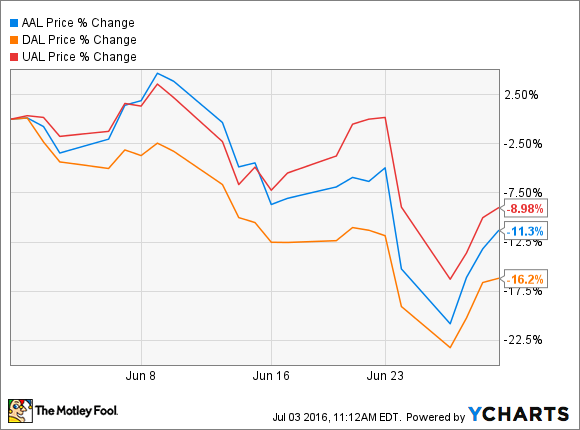 Airline stocks had another bad month in June. American Airlines (NASDAQ:AAL) stock fell 11% last month, while Delta Air Lines (NYSE:DAL) shares plunged 16%, according to data from S&P Global Market Intelligence. Shares of their fellow legacy carrier United Continental (NASDAQ:UAL) barely managed to avoid a double-digit drop, declining 9% for the month. Airline June stock performance. Data by YCharts. American Airlines, Delta Air Lines, and United Continental all have substantial international operations. As a result, all three stocks tend to be extremely sensitive to global political and economic dislocation. This put them among the casualties of last month's Brexit referendum in the United Kingdom. In the two days following the U.K.'s vote to leave the European Union, shares of all three legacy carriers plunged. The declines ranged from 13% at Delta Air Lines to 17% at American Airlines. The United Kingdom is a key market for all three legacy carriers. U.S.-U.K. routes account for more than 5% of systemwide capacity at both American Airlines and United Continental. Delta has a smaller direct presence in the U.K., but due to its 49% stake in British airline Virgin Atlantic, it effectively has a major presence there, too. Brexit could have a significant financial impact on these airlines. First, flights to London typically carry a large share of high-fare business class travelers. If falling business confidence causes companies to pull back on travel spending, unit revenue on those routes could fall significantly. Second, the British pound has fallen to a multiyear low against the dollar. This reduces the revenue airlines receive for tickets sold in the U.K.
Brexit could impact unit revenue at all three legacy carriers. Image source: American Airlines. That said, the U.K. hasn't taken any concrete action to leave the EU yet. Travel demand between the U.S. and the U.K. could rebound quickly. Indeed, United Continental announced last week that it will add flights from its West Coast hubs to London over the next year despite the Brexit-related uncertainty. Last month, Delta Air Lines stock was also weighed down by CFO Paul Jacobson's comment at an investor conference that the company might miss its Q2 unit revenue guidance. Back in April, Delta estimated that its passenger revenue per available seat mile (PRASM) would decline 2.5%-4.5% in Q2. PRASM then declined about 4% in April and 5% in May. Thus, Delta needed its revenue trend to improve from May to June just to reach the low end of its PRASM guidance. Instead, Delta reported on Tuesday that PRASM fell by about 5% again in Q2. As a result, it will miss its unit revenue guidance for the full quarter. Delta blamed the shortfall on lower fares for last-minute bookings. This suggests that business travel demand remains somewhat shaky. Delta Air Lines will miss its Q2 unit revenue guidance. Image source: The Motley Fool. United sees clearer skies -- what about American Airlines? Interestingly enough, United Continental announced in late June that its Q2 PRASM will wind up within the upper half of its guidance range. The carrier stated that unit revenue has exceeded expectations on its transatlantic and Latin American routes. United still expects PRASM to decrease 6.5%-7.5% year over year, which would be worse than Delta's projected performance. Still, investors were relieved that the revenue gap between United and Delta isn't widening even further. Investors are also happy about the $3.1 billion profit improvement opportunity identified by United executives on an investor call last month. This is probably why United Continental stock was able to avoid a double-digit decline in June. Meanwhile, American Airlines hasn't updated its guidance since April. Investors may have to wait until it releases its earnings report later this month to find out whether its performance was more in line with that of Delta or United. For all three airline stocks, the key to a second-half rebound is better unit revenue performance. If tighter capacity discipline and easier comparisons in the second half of the year more than offset the negative impact of Brexit, shares of American Airlines, Delta Air Lines, and United Continental could come roaring back in the next several months.